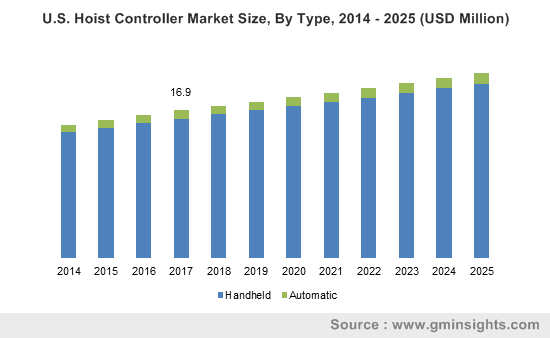 Hoist Controller Market size was valued over USD 82.9 million in 2017, and the industry will grow at a CAGR of upto 3.0% up to 2025. Hoist controllers are the equipment which are used for the movement of hoists. These controllers can be controlled in wired and wireless methods. All hydraulic hoists could be controlled by handheld controllers, while both handheld and automatic hoist controllers can control electric hoists. The hoist controllers find widespread applications in end-user industries such as automotive, cement, chemical, construction, marine, metal processing and other end-users such as pharmaceutical, mining, etc. The growing demand for both hydraulic and electric hoists is the key factor driving the growth of hoist controller market. The global hoist market is expected to reach USD 3.0 billion by the end of 2025, growing at a CAGR over 5% till the end of the forecast period. Increasing industrialization in the developing economies of Asia Pacific will significantly enhance the demand for all types of hoists. The mining and oil & gas industry verticals are on the rise from the past few years, and this will help the market to grow over the coming years. The handheld hoist controllers can be used for both hoists and cranes as well. The rising demand for cranes will further provide an additional demand for hoist controllers over the forecast period. Due to the increasing need for material handling in the manufacturing sector, the demand for cranes and hoists will grow significantly and this will influence the market positively over the coming years. The hoist controller industry is majorly restrained by their low quality. This market is highly fragmented, and majority of small scale companies produce substandard products. Hydraulic hoists can be operated by only handheld controllers, while electric hoists can be controlled by both handheld and automatic controllers. The demand for hoist controllers for use in electric hoists held a share of over 97% in 2017, and this will increase at a CAGR over 3.0% over the forecast period. The electric hoists are witnessing a significant growth in the developed economies, despite their expensive nature. This demand will further increase due to the increasing manufacturing sector over the coming years. The handheld hoist controller market held more than 90% revenue share in 2017. The handheld hoist controllers are otherwise called as manual hoist controllers. Manual hoist controllers are highly preferred by the consumers, due to their operative easiness. The automatic hoist controllers finds very few applications in any kind of industrial or manufacturing sectors. They are preferred for entertainment uses. The automatic hoist controller market will grow at a CAGR of over 2.5%, increasing from USD 4.6 million in 2017. In terms of end-user, the hoist controller market has been segmented into cement, automotive, chemical, metal processing, marine, construction and other end-users such as mining, pharmaceutical, etc. The handheld hoist controller market for cement end-user industry has the highest market share, followed by metal processing, automotive, and construction end-users. This is due to the increasing product demand for metal processing operations, which has high material handling requirements. Moreover, increasing industrialization in both developing and developed economies, are creating the demand for processed metals such as stainless steel, and iron from the past few years, which will in turn accelerate the need for handheld hoist controllers over the forecast period. The automatic hoist controller market for chemical end-user industry was over USD 550 thousand in 2017, and this will grow at a CAGR over 2.8% till the end of 2025. The demand for automatic hoist controllers is rising on account of rising computerized control systems in chemical industries in developing economies. Asia Pacific regional market held a major share of the global hoist controller market in 2017 and will show its similar dynamic till the end of forecast period. It is majorly due to the increasing industrialization in the economies such as China, and Japan. North America hoist controller market had the second-major share in 2017, with a size of over USD 19.6 million. This will grow at a CAGR over 2.5%. Due to established material handling business in both U.S. and Canada, the key manufacturering giants in this region will prefer automated controllers than handheld controllers, though their expensive nature. 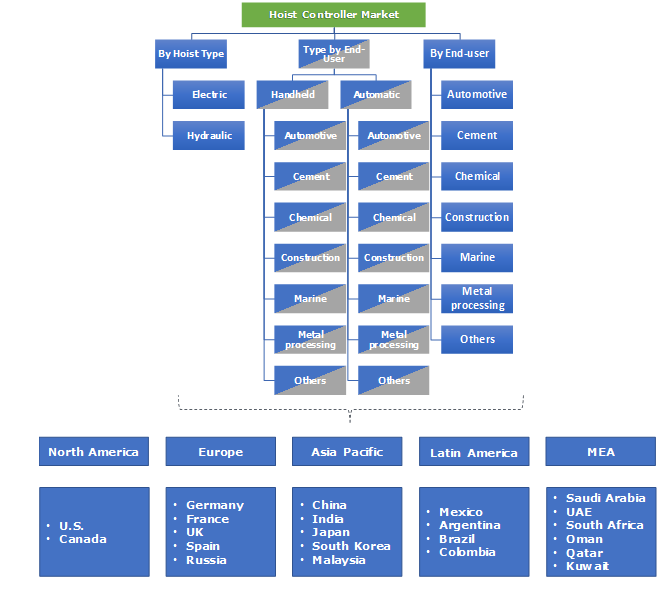 The major market share contributors of the global hoist controller market include Schneider Electric, Speed-O-Controls, Conductix-Wampfler USA, The Rowland Company, Uesco Cranes, Hoosier Crane Service Company, Demag Cranes & Components Corp., Eastern Electric Corporation, and Magnetek Inc. among others. Prominent players in this market are trying to expand their business and their market impact through numerous mergers & acquisitions. The global hoist controller market had witnessed a moderate growth from the past few years. This market is primarily dominated by the Asia Pacific market till the end of forecast period. Growth indicators are primarily from increasing product demand from product end-users. This market study covers the use of hoist controllers for hydraulic and electric hoists only. The demand of hoist controllers for pneumatic hoists has not been considered in our study, as the use of air hoists is expected to exhibit negative growth indicators over the coming years.